Posted in Pork, Veggies/sides, on June 16th, 2018. Simple spice-rubbed pork tenderloin, but served with luscious cooked carrots. Who knew they could taste so good when roasted? You may want to make these again and again. Then there’s the grits, creamy with smoked Gouda. And then there’s the salad too, with a sherry and honey mustard vinaigrette. Pork tenderloin is something I cook for myself now and then. I probably should buy one, cut it in half and freeze the other half because one pork tenderloin (at least the Costco ones) are big – usually enough for 4 meals for me. Maybe even 5 if I don’t dole out too much on any one serving. And by day three, I’m tired of pork tenderloin! But this meal, this pork tenderloin is merely a way to eat the scrumptious carrots on top, the creamy grits with Gouda and the lovely green salad on the side. I’m telling you true, your fork is going to want all of those carrots to the exclusion of everything else on the plate. The carrots, scrubbed and halved, are roasted for 15-20 minutes in a hot-hot oven, sprinkled with some kind of various spice rub (your choice). Once cooled, you whiz some of them up with pine nuts and olive oil to make the Romesco part. The remaining carrots are served in the salad. The pork is seasoned with the same spice rub, browned on the stove, then finished off in the oven. Meanwhile, you make the grits – using a combination of broth and milk to make them creamy, then at the last, add in the Gouda (did you know it’s pronounced gow-da? not goo-da, as we do?) 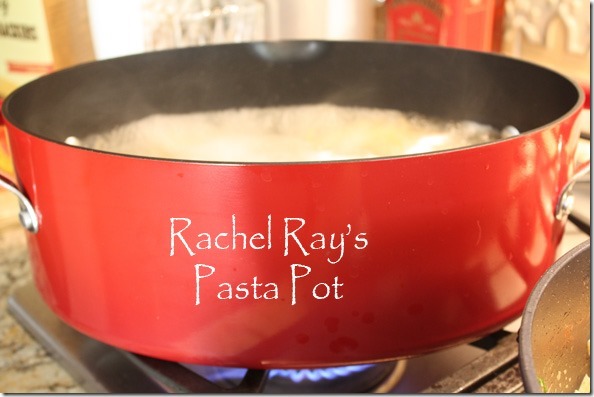 and serve it right away while it’s still piping hot. When I make this, I use regular Gouda, not smoked. I’m not a big fan of smoked cheeses for some reason – I like the pure stuff, but suit your own palate. 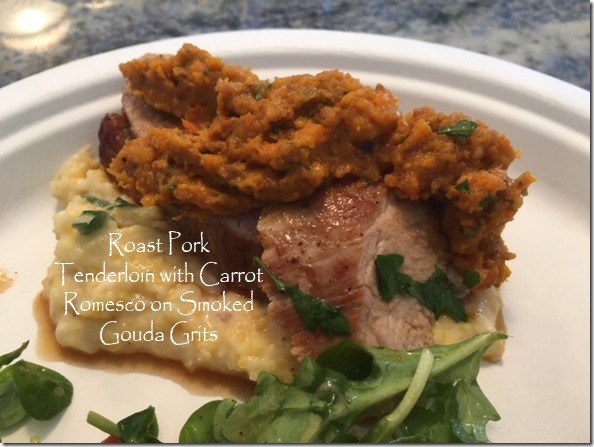 Place the pork tenderloin slices napped over the edge of the grits and top with the Romesco carrots. 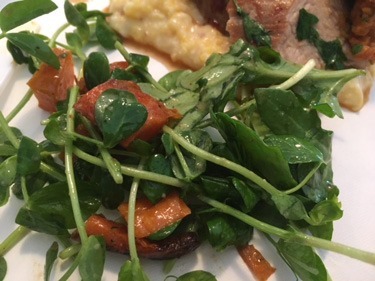 You will have tossed up a lovely green salad too (adding arugula for sure, maybe even watercress or some other unusual greens if you can find them), toss with the sherry wine vinegar vinaigrette and the remaining carrots, and that’s dinner. The recipes came from a cooking class a couple of months ago with Tarla Fallgatter. I was still eating some carbs then, so I can attest to the deliciousness of those carrots. Now I’m only eating raw carrots. What’s GOOD: well, the carrots Romesco are the best part of this dish in my opinion, but the grits are good, as is the pork AND the lovely greens on the side. Altogether great meal – would definitely be suitable for a company dinner. What’s NOT: maybe a bit more prep than some meals. 1. Preheat oven to 450°F. Toss carrots with oil, spice rub and salt and pepper to taste. Spread out on a rimmed baking sheet and roast, tossing occasionally, until carrots are softened, browned, about 15-20 minutes. Carrots should be very tender. Let cool slightly. 2. Meanwhile, season pork with salt, pepper and spice rub. Heat a saute pan to high, add oil and sear tenderloin on all sides. Transfer to oven and roast until a thermometer inserted into the center registers 145°F, about 10 minutes. Remove, tent with foil and let rest for 10 minutes before slicing. 3. Pulse the pine nuts, garlic and red chili flakes in a food processor with oil, salt and pepper to taste. Add about a cup of the cooked carrots, vinegar and process until it reaches a coarse texture, adding more oil if necessary. Taste for seasonings. 4. SALAD: Toss the greens and the remaining carrots with vinaigrette. Slice pork and serve with romesco alongside the salad. Per Serving: 373 Calories; 28g Fat (66.8% calories from fat); 19g Protein; 13g Carbohydrate; 4g Dietary Fiber; 49mg Cholesterol; 90mg Sodium. 1. Bring milk, salt and water to a boil in a large pan over medium high heat. Gradually whisk in grits until smooth. 2. Reduce heat to low, cover and cook, whisking frequently, until creamy but still with some bite, 20-25 minutes. Remove from heat and whisk in butter and cheese. Season with salt and pepper to taste. 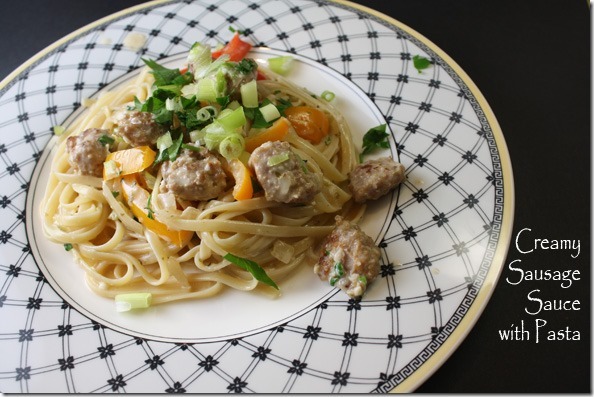 Serve topped with Italian parsley. Per Serving: 164 Calories; 10g Fat (52.5% calories from fat); 6g Protein; 13g Carbohydrate; trace Dietary Fiber; 33mg Cholesterol; 457mg Sodium. Posted in Pork, Veggies/sides, on October 26th, 2017. Comfort food at its finest. Brown food is never very revealing in a photo . . . just trust me this is worth trying. Aren’t pork chops just a simple way to get dinner on the table in fairly short order? Back in the days when I was working full time, pork chops were a regular on my evening dinner rotation because they could be prepared quickly. I won’t say that this method is quite that streamlined, but it won’t take you too much longer than a quick sauté in a pan and a short bake time to have this on your dinner table. 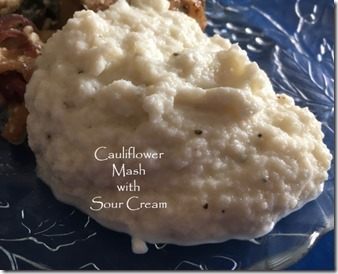 I’m also including a new recipe for cauliflower that’s prepared to look like mashed potatoes. I liked this version better than the version I’ve made in the past. The pork chops are served alongside some nicely pan-sautéed apples that make a great accompaniment to the pork. Do make them – hopefully you have some apples, right? The pork chops need to be brined for awhile – the recipe (from a cooking class I took) says 1-4 hours, but if you’re a working person, I truly don’t think brining for 8 hours would make any difference. The brine solution isn’t too salty (that would be the risk, that they’d absorb too much salt). But if you only have a short time, an hour will do it too. This brine is made with maple syrup, salt, of course, and water, heated to dissolve the salt. The purpose of simmering is ONLY to dissolve the salt, so I recommend you dissolve the salt in a cup or so of water, and the syrup, then add cold water to make up the water portion. That way you’ll get the pork chops in the brine a lot sooner. Or make it the night before and have it chilling. The brine also contains cider vinegar, peppercorns, apple cider and some fresh sage leaves. Then you toss out the brine, blot the pork chops dry with paper towels and rub with olive oil and salt and pepper. This dish is made in a cast iron skillet (or another type of heavy skillet, like Le Creuset). That way you’ll get a nice sear on the meat and it holds the heat well while it roasts in the oven. The pork is browned on both sides briefly, then popped into a 400°F oven for 6-10 minutes (depends on how thick your pork chops are). Pork is done at 145°F internal temp. Use an instant read thermometer to make sure. Meanwhile, just before the pork comes out of the oven (while it’s baking) peel, core and wedge some Gala or crispy apples, sauté them in a little butter and olive oil (with some red onion) and lastly you add some maple syrup and just before serving, spoon in some crumbled Feta. In another pan you sauté a few sage leaves until crispy (watch carefully). I usually don’t have sage leaves, so if you don’t either, just eliminate that part. 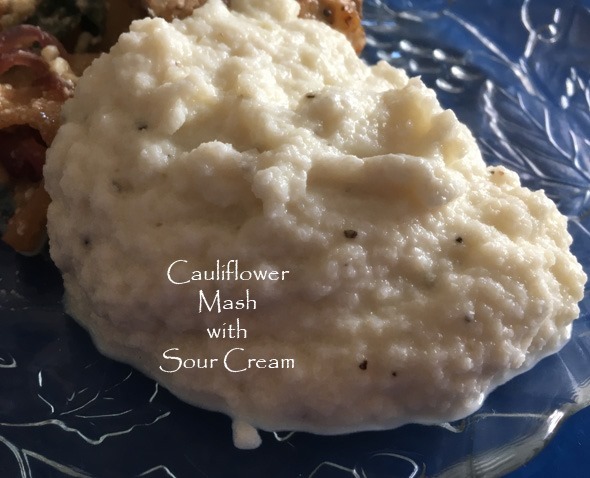 The cauliflower mash is very easy and quick – buy a whole one, or the newer packages of riced cauliflower if you’d prefer. Cook the cauliflower in salted water until barely done, drain, then pulse in a food processor along with some whole milk, sour cream, butter, salt and pepper. Easy. Of course, it doesn’t taste exactly like mashed potatoes, but I’m telling you for sure, you’d be hard pressed to know if you’re eating it alongside pork and apples. 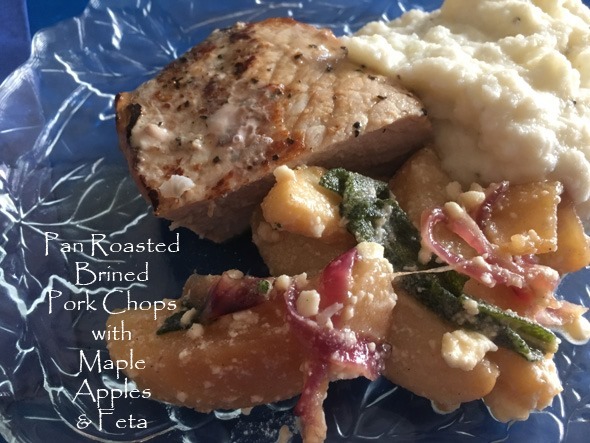 What’s GOOD: Delicious tasting pork with the sweet maple flavored apples alongside. Altogether scrumptious in my book. The cauliflower is also easy and a good way to eat your veggies without eating carbs. The sour cream is a nice addition to them. What’s NOT: A little more prep than some, but not overly so. Would make a great company meal. If you have a helper in the kitchen, making this for a family weeknight dinner would be easy too. 1. Brine the pork: combine salt, maple syrup and water in a saucepan. Simmer, stirring, until the salt has dissolved. Let cool to room temp. Add cider, vinegar, peppercorns and sage. Submerge the pork chops in the brine and refrigerate for 1-4 hours. 3. Remove pork from brine (discard brine) and pat dry with paper towels. Set the pork on a plate, cover with plastic wrap and allow pork to come to room temp, about 30 minutes. 4. Rub the pork with olive oil and season with salt and pepper. Heat a large cast iron skillet over medium-high heat. Add pork and sear on one side for 3 minutes. Turn over, then transfer skillet to the preheated oven. Roast for 6-10 minutes, or until pork has reached an internal temp of 145°F. Transfer to a heated plate and pour any pan juices on the meat. Let rest for about 5 minutes. 5. APPLES: Melt butter with olive oil in a large skillet. Add sage leaves and fry for less than a minute (do not burn). Remove sage to a paper towel and set aside. Add onion to skillet and cook about 5 minutes, then add apples, and cook for 6-8 minutes, until apples are softened. Add maple syrup and cook for just a minute. Remove apples from the heat, fold in the crispy sage leaves and crumbled Feta cheese. 6. Serve pork with apples along side. Per Serving: 512 Calories; 26g Fat (44.5% calories from fat); 25g Protein; 47g Carbohydrate; 4g Dietary Fiber; 84mg Cholesterol; 3903mg Sodium. 1. Cook cauliflower in simmering salted water until tender, about 5-7 minutes. Drain. 2. Place cauliflower in food processor with remaining ingredients and pulse until smooth. Taste for seasoning. Per Serving: 61 Calories; 4g Fat (52.0% calories from fat); 2g Protein; 6g Carbohydrate; 2g Dietary Fiber; 9mg Cholesterol; 56mg Sodium. Posted in Pork, on September 14th, 2017. Ever done pizza on a grill? I did once years ago. It’s easy, really. This one has leeks on it, and that makes a difference – leeks just add a depth of flavor to things. As much as I love pizza, I know it’s not exactly a healthy meal. I really do eat few bread-type carbs. I seem to make up for the calories in other ways – I don’t do this to diet. I know a lot about diabetes since my DH was a Type 1. And it was only in his last 25 years, I’d guess, that doctors figured out that blood sugar was directly related to carb consumption (whether they be bread, potatoes, rice, fruit or sugar or any kind). I began preparing a low-carb diet for us starting way back then, but even more so once we both retired. Dave loved pizza too, but he couldn’t stop eating it if is was put in front of him, so we kind of banned it from our menu. Ready-made pizza (like frozen from the grocery store) has never been all that great tasting – once in awhile I succumb getting a thin crust one. So that leaves making it from scratch. 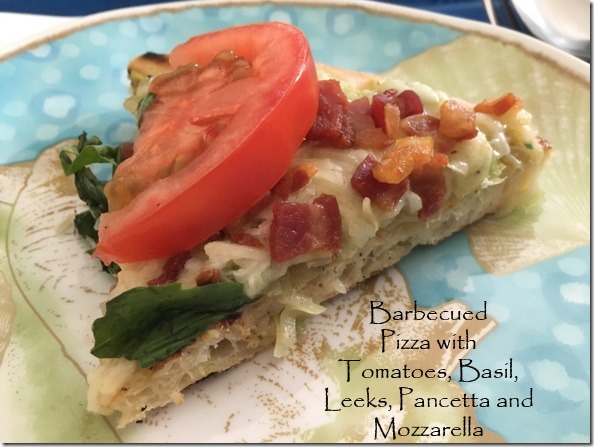 Here on my blog I have one favorite pizza – I’ve mentioned it before – it’s one our daughter Sara introduced us to when she was visiting one weekend (when she was in college). There are other pizza recipes on my blog (just type in “pizza” in the search box top left), but this one, Pizza with Chicken, Red Onion, Pesto & Olives, is one I’ve returned to many times over the years. My mouth is watering as I type. But I digress . . . pizza isn’t something I make much as a widow – I have my DH’s problem of not being able to stop eating it. But this pizza I’m writing about today, was really good. Really easy and worth the trouble to make your own dough. It’s from a cooking class with Susan V a few weeks ago. She made the dough earlier in the morning, so it had had a chance to do one rising before all the students arrived for the class. She punched it down and let it rest another hour or so, then began working with it. She used cornmeal underneath the dough so it wouldn’t stick and used a pizza peel very successfully. Susan doesn’t like Trader Joe’s pizza dough – she says it sticks and she simply can’t roll it out. So she chooses to make her own, always. Meanwhile, she sliced the tomatoes (I’d slice them thinner than you see in the photo above) and set them in a colander to drain. You don’t want lots of juices – save them, though, and put them in something else as the juice of tomatoes contain a lot of flavor. Add it to soup or a stew, or even a salad dressing. The leeks are sautéed in a little oil and cooked for 15-20 minutes until they’re very soft. You remove them, then sauté the pancetta until the pieces get lightly brown on the edges. Drain them on a paper towel and set aside. This recipe makes 2 pizzas – enough for 4-5 people, unless they’re really hungry. Susan divided the pizza dough in half and rolled them out to about 12” rounds, I’d say. Onto the peel it went and she placed both on the heated grill (medium-high). She cooked them until the TOP of the dough began to puff up – it gets these lovely little peaks and valleys. That took about 2 minutes! She brought them inside, turned them over (see photo) and patted them down, to break the puffy peaks underneath. She only cooked them on one side up to this point. Then she put all the toppings on to cooked side (leeks, pancetta, mozzarella, olive oil and lots of sliced basil, and lastly the sliced tomatoes). Back to the barbecue for only a few minutes (max 3-4). It doesn’t cook anything on top (the toppings) but merely cooks the dough on the other side and heats up everything and melts the cheese. Remove, slice immediately, and serve. What’s GOOD: everything about this pizza was good. I wanted more (my downfall when it comes to pizza) than the one slice I got. It looks like fun making it – get your family involved – they can use their own selection of toppings. It’s easy (except for the 2 risings of the dough which takes awhile). What’s NOT: just that making your own dough takes awhile. Nothing about this was difficult, though. 1. Slice tomatoes and place in a colander to drain for 30 minutes. 2. Heat oil in a medium skillet and saute the leeks, stirring occasionally, for about 15-20 minutes, until wilted. Season with salt and pepper. Remove and set aside. 3. In same skillet cook the pancetta until it’s crisp and slightly brown. Drain on paper towels. 4. DOUGH: In a small bowl sprinkle yeast over the warm water. Let stand for about 10 minutes until it looks creamy and foamy on top. Stir to dissolve all the yeast. 5. In a food processor, combine the flour and salt and pulse briefly. With motor running add olive oil and gradually pour in the yeast mixture. Process for about one minute to knead the dough. Transfer dough to an oiled bowl, cover with a damp towel and let rise in a warm place until doubled in volume, about an hour. 6. Punch down the dough and knead briefly on a floured surface. Return dough to the bowl, cover again and allow to rise until doubled in volume, about 30-45 minutes. 7. Divide dough in half. (If possible, allow dough to sit on your board for about 10 minutes to rest – it will make it easier to roll out. Pat or roll each piece into a 9″ round shape on a floured board. Brush the tops of both pizzas with olive oil. 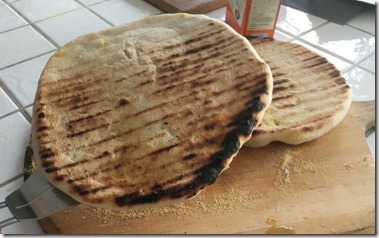 Place rounds on a pizza peel and transfer to a medium-high heated barbecue grill. Place pizza over direct heat (BUT, watch it like a hawk!) and cook until the dough begins to puff in places and the bottom is showing brown on the edges. Don’t overdo it!! Remove pizza from the grill and close lid on the grill to retain heat. 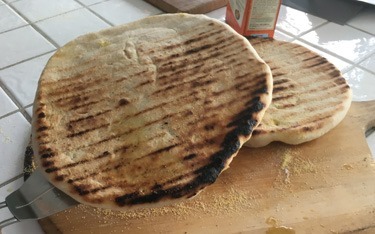 Back in the kitchen, gently press down on the puffed-up parts of the dough, then turn grilled dough over (so the uncooked side is on top). Brush top with more olive oil. 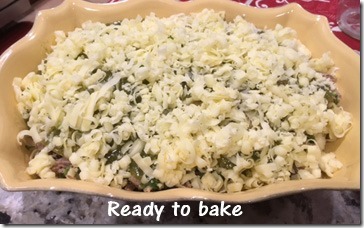 Divide the leeks between the two crusts, sprinkle each with about 3/4 cup of shredded Mozzarella. Divide and arrange the pancetta on both, then overlap tomato slices. Sprinkle top with basil. 8. Place pizzas back on the grill and cook for just a few minutes – only until the cheese is melted. Watch very carefully so they don’t burn. Remove from the grill, cut into wedges and serve immediately. Per Serving: 629 Calories; 34g Fat (47.9% calories from fat); 24g Protein; 58g Carbohydrate; 4g Dietary Fiber; 56mg Cholesterol; 1695mg Sodium. Posted in Beef, Pork, on March 13th, 2017. Might you think I’ve made a typo? 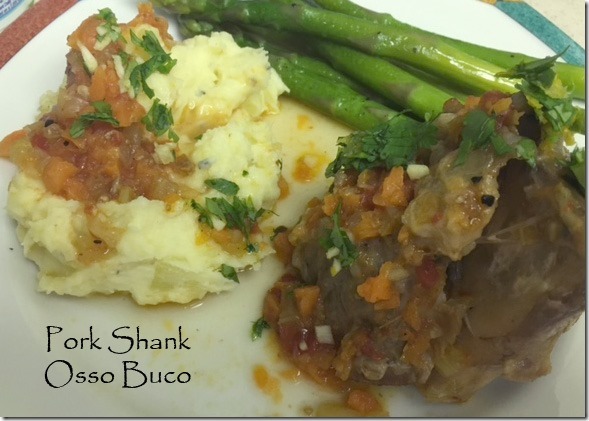 PORK Osso Buco? Yes, it’s pork, not veal. Ever since I had osso buco the first time (probably in the 1980s) I’ve loved it. But as time has gone by, less and less have I purchased veal, for one thing (on general principles) but also because veal is so gosh-darned expensive. SO, when I was watching some food tv show recently they mentioned making osso buco with pork shanks. What a great idea, was my reasoning. So, sure enough, because we have a large Hispanic population where I live, it took me no time at all to locate a Mexican butcher shop. A bodega. A tiny place, where Mexican music was blaring inside, and filled with a variety of mothers and children, all speaking in rapid Spanish. I approached the meat case. The butcher spoke great English, and after clarifying what I wanted, he said SURE, come back on Wednesday. We get the legs in that day, come after 3pm. I did – he showed me a big, frozen shank bone and we discussed what part of the shank I wanted. I wanted meaty shanks. I also asked where the pork came from (I didn’t want to buy pork imported from Mexico). He assured me it came from the Midwestern U.S. Good! I asked him to cut them crossways about 3” thick. He did exactly that. The shanks were frozen, so I left them that way until I was ready to prepare them. Meanwhile, I’d located a recipe online, from Jeff Mauro, at the Food Network. I also printed out my old, regular veal osso buco recipe, and compared them, side by side. They’re very similar. I haven’t made veal osso buco since I started my blog in 2007, so I’m going to print the recipe down below, even though I’ve not made it for this post. I’ve had osso buco in countless restaurants, and none have compared with the ones I’ve made here at home using the recipe down below. A few weeks ago, when I made this, I was out in the desert (the California desert), and the night I made this dish it was greeted with great accolades from my friend, Ann, who was with me. She is home in Idaho now, and says she’s going to make it for friends. She LOVED it. So did I. It’s made just like making it with veal – it’s a braised dish. Easy. After browning the sides, the meat is baked (covered) in a slow oven for about 3 hours with the veggies and aromatics. The recipe indicated 2 hours at 325°. It wasn’t done after 2 hours, so I reduced the temp to 300° and cooked it another 45 minutes or so. I also didn’t have twine – once the shanks are cooked to perfection, they literally fall off the bone, so you do want to wrap them in twine if possible. 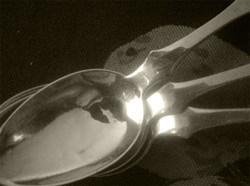 I managed to hold them together by using a big slotted spoon. While the shanks baked, I made the gremolata. Now, I must tell you – do NOT make this without the gremolata – I think the lemon zest, and orange zest if you use it, are key ingredients to the overall taste of osso buco. There’s something about that fresh zest that gives this dish a finished zing. I prefer to make the gremolata shortly before it’s needed, so the zest is still super-fresh off the fruit itself. If I’d had a stick blender, or even a regular blender, I would have whizzed up the veggies and braise liquid, but there wasn’t one where we were staying. So it was just served with some of the braising liquid and veggies spooned on top of both the meat AND the lovely mashed potatoes we made to go with it. Traditionally you serve creamy polenta with this, but I had potatoes, and I thought they were just great with it. Maybe easier than making polenta. The gremolata is a garnish. What’s GOOD: comfort food at its finest! Falling off the bone, luscious, tasty, tummy warming. Easy. A definite keeper. My friend and I licked our plates clean. What’s NOT: only that you have to wait a few hours to eat it – it requires a few hours of baking time. Very easy otherwise. 1. Preheat the oven to 300°degrees F. Heat a large Dutch oven over medium-high heat. Liberally season all sides of the shanks with salt and pepper. Add 2 tablespoons of the oil to the pan and sear the shanks until golden brown on all sides, about 5 minutes a side. Transfer to a plate. 2. Add the remaining tablespoon of oil to the Dutch oven, then add the carrots, celery and onions. Season with salt and pepper and saute until the vegetables are slightly soft and browned, about 8 minutes. Add the tomato paste and garlic and saute until fragrant, about 30 seconds. Add the wine to deglaze, scraping all the bits off the bottom. Add the shanks, any accumulated juices, the warm broth, tomatoes and bay leaves. Cover, transfer to the oven and cook until the shanks are extremely fork-tender, about 3 hours. Remove the shanks and tent with foil on a plate. 3. If the braising liquid is a bit thin, right before serving, simmer the remaining liquid until thickened slightly, 5 to 10 minutes. Add additional salt and pepper if necessary. If possible, use a stick blender in the liquid to puree it. Cook’s Note: The shanks can be stored for up to 2 days in the braising liquid. 4. On each plate, place a warm shank with a ladle of rich braising liquid, then top with the fresh Gremolata. 5. Gremolata: Mix the parsley, lemon zest, orange zest and garlic together in a bowl and season with salt and pepper. Per Serving: 286 Calories; 11g Fat (44.3% calories from fat); 9g Protein; 22g Carbohydrate; 5g Dietary Fiber; 1mg Cholesterol; 477mg Sodium. 1. Dry meat with paper towels and season with salt and pepper, then dust with a little flour. Brown the shanks, a few at a time, in the butter/oil mixture until golden brown, top and bottom. Remove shanks from the pan and set aside. To the pot add wine, cooking it over high heat, scraping up the brown bits sticking to the bottom and reduce the mixture to about 1/2 cup. Pour mixture out and set aside. 2. 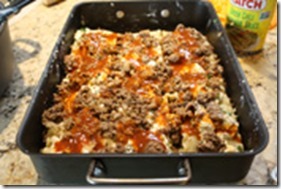 In a flameproof casserole, just large enough to hold the veal shanks in one layer, saute the onions, carrots, and celery until soft and lightly colored along with the garlic and additional butter. Add veal, the reduced wine mixture and chicken stock – just enough to almost cover the shanks, or about 1/2 way up. Spread tomatoes on top and add herbs, salt and pepper to taste. Bring to a simmer over moderately high heat. 3. Place pot in a 325°F oven for 2 hours, or until the veal is tender. 4. Transfer veal with a slotted spoon to a serving dish; remove strings and keep warm. Strain the pan juices into a pan and puree the vegetables in a blender or food processor. Cook the juices and the vegetables together until reduced to about 3 cups of liquid. Baste the veal with some of the reduced juices and bake it, basting 3-4 times with the juices, for 10 minutes more, or until the veal looks glazed. Remove to a hot serving platter and pour some of the juices around it, then garnish with the gremolata. 5. GREMOLATA: Combine ingredients and mix together. Per Serving: 740 Calories; 33g Fat (42.4% calories from fat); 84g Protein; 17g Carbohydrate; 6g Dietary Fiber; 331mg Cholesterol; 1477mg Sodium. Posted in Beef, Pork, on November 6th, 2016. Until a couple of weeks ago I’d never heard of a recipe mash-up. It’s when you take two different dishes and put them together to make something different, part of one and part of another. The TV show I’d watched was an episode of Pioneer Woman, and she’d made a chicken enchilasagna. 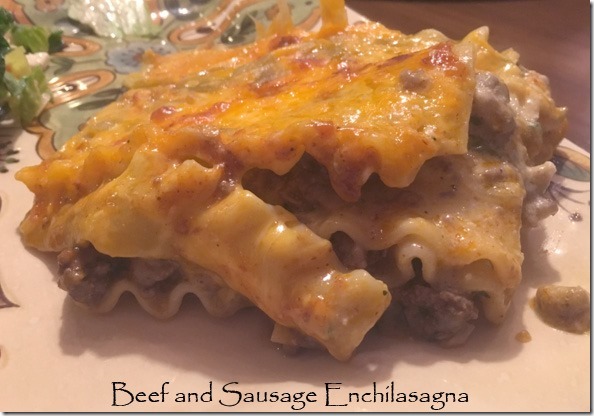 So, part enchiladas, and part lasagna. The dish sounded really good. My son and his family have moved recently from a town near me, to a town near Pasadena (east of downtown Los Angeles). That’s where my son works, and he’d been commuting for all the years he’s worked there (many). They hated leaving their home, but it was the right thing for them. They’ve bought a new home there and I went for the weekend to help them get more moved in. So I decided I’d make this casserole to take along with me to help feed us one of the dinner meals. I did make a departure from Ree Drummond’s original recipe. I’d been eating cubed-up turkey breast for about 6 straight days (in salad) and wanted a different protein. So I used ground beef and some Italian sausage instead. And, I read all the reviews on the Food Network site and took those comments into consideration as I made this. I used part whole milk ricotta and part cottage cheese, plus Jack cheese for the cheese filling (photo here). I didn’t use as much canned red and green enchilada sauce as directed, as many people said it was too loose and soupy. I used real onion (instead of onion powder) and real garlic (instead of garlic powder). My big baking pan didn’t hold 4 lasagna noodles, either, so I adapted the recipe with 3 layers of 3 noodles and the top layer I used 4 noodles overlapping so the top was a complete flat surface to hold the cheese and some more enchilada sauce. There at right you can see the almost finished pan full of it. I added one more layer of lasagna, sauce and a lot of grated sharp cheddar cheese. If you only eat one portion, the pan might feed 10-11, but if you have hungry mouths to feed, less, of course. There at left you can see the finished (and fully baked) casserole. What’s GOOD: Oh my goodness, was this ever delicious! I mean it was fantastic. The combination of flavors was really good. Very cheesy. Very flavorful. Gooey and comforting. After a day of unpacking things at their house, it was so nice to slide this into the oven and dress a green salad and there was dinner. The casserole is easier to make than lasagna because you don’t have to make a red marinara sauce. What’s NOT: nothing really at all. I liked it so much I’ll definitely be making it again. NOTES: If you want to increase the amount of meat, cheeses and noodles, you can probably make 1 large casserole and 1 small one – then you’ll use up all the enchilada sauce, a full container of ricotta and cottage cheese, and probably a whole box of lasagna noodles. 2. In a medium skillet saute the ground beef and sausage together over medium heat, chopping up the meat into small pieces as it cooks. Add onion and garlic, then cumin and chili powder. Continue cooking until all the pink is gone from the meat and the onion is cooked through. 3. Cook the lasagna noodles until al dente (they’ll cook further during the baking time). Soak in cold water so they don’t stick together. Set aside. 4. In a medium bowl combine the jack cheese, ricotta, cottage cheese and parsley. 5. 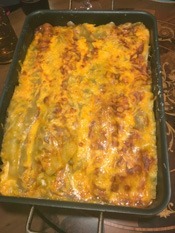 Using a large rectangular baking dish, pour about 1/4 cup or less of each of the canned enchilada sauces over the bottom. Spread to cover all of the bottom surface. Drain the lasagna noodles and place 3 noodles in the pan. Add a third of the meat mixture, then a third of the cheese mixture and drizzle a little more enchilada sauce (both) over the top. Add two more layers of noodles, sauce and fillings. Place 4 noodles on the top, overlapping them a little bit. Drizzle with sauce so all the noodles have some sauce on them, then sprinkle the grated sharp cheddar cheese over the top. 6. If baking immediately, it will take about 25-30 minutes to heat through. If refrigerated (covered) before baking, plan on it taking about an hour. Cut into generous squares and serve. Per Serving: 950 Calories; 44g Fat (41.8% calories from fat); 47g Protein; 89g Carbohydrate; 4g Dietary Fiber; 137mg Cholesterol; 961mg Sodium. Posted in Pork, on March 3rd, 2016. Mexican Comfort Food. Easy. Gooey with melting cheese, tasty with pork carnitas inside, and a bit of sour cream to make it over the top. Of all the recipes on this blog, you can count only a few that are truly Mexican. Like Mexican restaurant combination plate items. Why? Because I have such wonderful Mexican restaurants within a few miles of my house, and their food is pretty darned good. 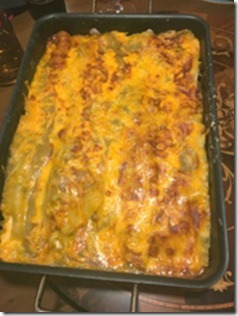 In years past (prior to 1976) I used to make Mexican dishes at home, but that was because they were: (1) relatively inexpensive to make; (2) could feed a lot of people; and/or (3) I couldn’t get decent Mexican food where I lived. But now, and for the last 40 years I’ve lived close to a Mexican population and restaurants abound. However, none of them make casseroles. They make tacos, burritos, tortas, taquitos, enchiladas (chicken, beef or cheese) and tostadas. Oh, and chile rellenos (one of my favorites). 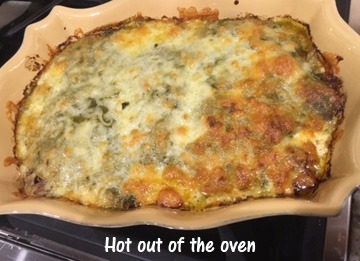 Years ago I used to make a chile relleno casserole that used canned Anaheim green chiles filled with a mixture of cream cheese and Jack cheese, dipped in egg, then flour and briefly fried, then baked in the oven for 20-25 minutes. I haven’t made those in years. They don’t resemble the rellenos I get at my favorite local Mexican place, Jalapeno’s, on First Street in Tustin, CA. I eat there about once a week, where I often run into friends who read my blog (hi, Mary). It’s a very popular place in our neighborhood, and they make awesome Mexican food. So why did I decide to make a Mexican dish? Well, I read the blog, Homesick Texan. 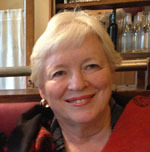 Lisa Fain grew up in Texas, but has lived in NYC for a long time, and she misses her home town Tex-Mex food, big time. 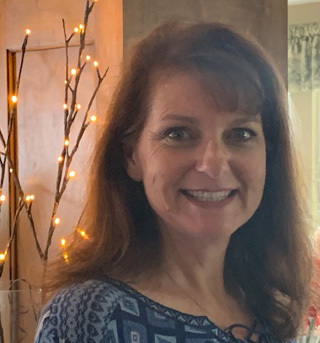 She regularly returns to Texas to visit, and her blog reads like a travelogue – she goes from restaurant to restaurant to stock up on her Mexican or Tex-Mex favorites. She can’t get enough of it. 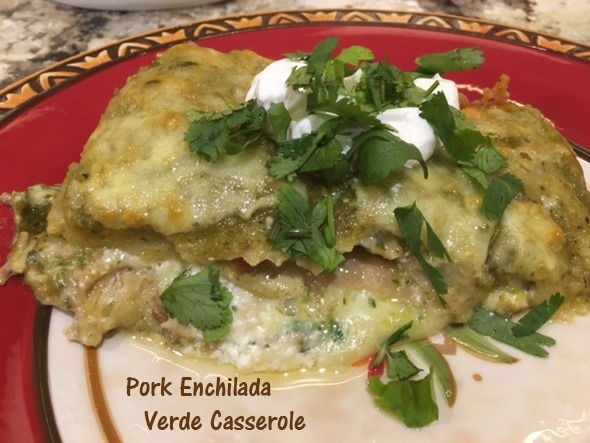 She created this casserole as an easy way to have pork enchiladas, but without the fussiness of filling and rolling up the corn tortillas and lining them up like soldiers. All the ingredients that go into enchiladas are there, but she merely layered them in a casserole and you cut it into servings, kind of like lasagna. I’ve now made this twice and have changed a few minor things: (1) I layered it 4 layers deep (not 3) which makes for a bit more depth, obviously. (2) I added just a bit more cheese; and (3) I dolloped some sour cream inside the layers, not just as a garnish for serving. If you go to Lisa’s blog, you can read her recipe which has you cooking your own pork. I chose not to do that merely because I’d have so MUCH pork left over, since I’m just a one person household now. So, instead, I stopped at Jalapeno’s one night and I bought 3/4 pound of carnitas, and they gave me the pork, but also a foam container of raw onions and a huge pile of cilantro. All things to use in this casserole too. Yippee! I did make the sauce, which was relatively easy. You could, if you live where grocery stores sell fresh tomatillo salsa, use that. 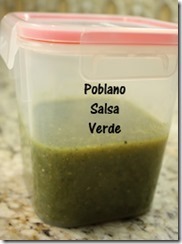 Lisa’s salsa also has poblano chiles in the mix, which gives a lovely depth of flavor. I understand that some Mexican markets sell canned poblano (pasilla) chiles – I haven’t found them, but if so I’d just add one of those to the tomatillo salsa. 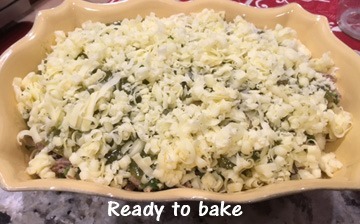 This casserole is SO easy to put together once you line up all the ingredients: the grated cheese, the shredded pork, minced onion, the salsa verde (see right), sour cream, and you merely need to soften the corn tortillas in a frying pan in a tiny, tiny bit of oil and put them in a casserole dish. Then you layer, and layer, and layer. Ending up with tortillas, salsa and heaps of cheese on top. Into a 350° oven it goes, and 30 minutes later you have dinner. Garnish with more cilantro and sour cream. If I made this for a group, I’d definitely buy a pork shoulder roast and make the pork carnitas myself. Pork shoulder is one of the cheaper cuts of meat you can buy these days, and it’s pretty easy to do the long, slow cooking to get it to peak tenderness. Shred it up, and just get all the ingredients together and the casserole all comes together in a jiffy. I’d serve this with a green salad with not too many vegetables (tomatoes, celery, green onions) and a vinaigrette of some kind. Have chips and salsa for an appetizer, and make Tres Leches cake for dessert. Done. Easy. What’s GOOD: everything about this casserole is good – the pork, the cheese (yum), the tomatillo-poblano salsa, and all the cilantro, sour cream. Oh goodness, it’s just fabulous. Will definitely be making this again. What’s NOT: making the pork from scratch takes a few hours; the salsa takes a bit of prep, but it will keep for a few days. Assembling the casserole is cinchy easy. Not much downside since I used pork carnitas from my local Mexican eatery. NOTES: You could easily use leftover pork (roast?) instead of making carnitas. It might not have quite the same flavor, but it would be close enough. Pork shoulder meat (long threads) would be more tender, so if using a roast, cut or tear into very small shred-like pieces. 1. SALSA: Turn on the broiler and place a rack 5 inches away from heating element. Line a cast-iron skillet or baking sheet with foil and place the poblano chiles, jalapeños, tomatillos, and garlic on the skillet. Cook under the broiler for 5 minutes, and then remove the skillet from the oven. Remove the garlic from the skillet and place into a blender. Turn over the poblano chiles, jalapeños, and tomatillos, and return the skillet to the oven. 2. Continue to broil the chiles and tomatillos for 5 to 7 more minutes or until they are nicely charred. After this time, remove the skillet from the oven. Place the tomatillos in the blender, and put the chiles into a paper sack or plastic food-storage bag, close it tight and let the chiles steam for 20 minutes. 3. Pour the 1/2 cup of water into the foil-lined skillet, swirl it around, and then pour this into the blender. 4. After the chiles have steamed, remove from the bag and rub off the skin. Remove the stems and seeds from the chiles and add them to the blender, along with the cilantro. Blend until smooth. You should have about 3 cups of salsa. Stir in the salt, taste and add more salt if you like. 5. CASSEROLE: Preheat the oven to 350°F. 9. To assemble the casserole, ladle 1/3 cup of the salsa verde into an oval ceramic casserole dish or a 9-inch cast-iron skillet. Place 3 of the tortillas in the pan, tearing in pieces to fill in any gaps. 10. Evenly top the tortillas with a third of the pork, 1/3 of shredded Monterey Jack, a third of the diced red onions, a third of the chopped cilantro, a drizzle of sour cream, and 1/3 cup of the salsa. Top that layer with 3 more tortillas and then add the rest of the pork, etc. Make 3 full layers, then top with the remaining tortillas, salsa and grated cheese. 11. Bake uncovered for 30-35 minutes or until the casserole is lightly browned and bubbling. Allow to rest for 5 minutes before serving. Serve warm topped with sour cream and cilantro. Per Serving: 352 Calories; 21g Fat (53.4% calories from fat); 16g Protein; 26g Carbohydrate; 4g Dietary Fiber; 51mg Cholesterol; 459mg Sodium. Posted in Pork, on February 20th, 2016. Well, this one isn’t healthy, what with the cream in the sauce, but if you only have 1-2 tablespoons of it, it can’t be too bad. 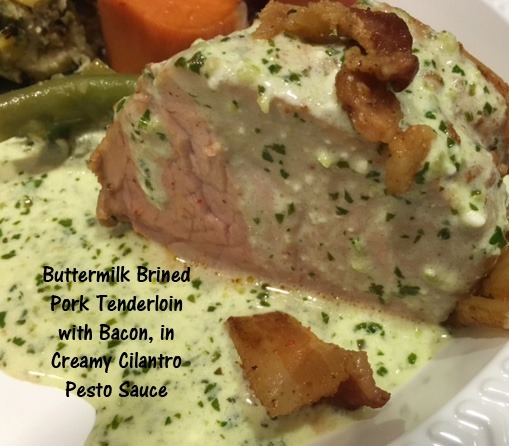 A tender (and lean) pork tenderloin that’s brined in spiced-up buttermilk is browned in a pan then oven baked. THEN, you make the insanely wonderful sauce with cilantro, jalapeno, lime juice, goat cheese, butter, and more than a tetch of heavy cream. Oh my goodness, is this recipe wonderful. I almost forgot to post it. It came from that great Diva class I attended in December, with Diane Phillips and and Phillis Carey (this is Phillis’ recipe). 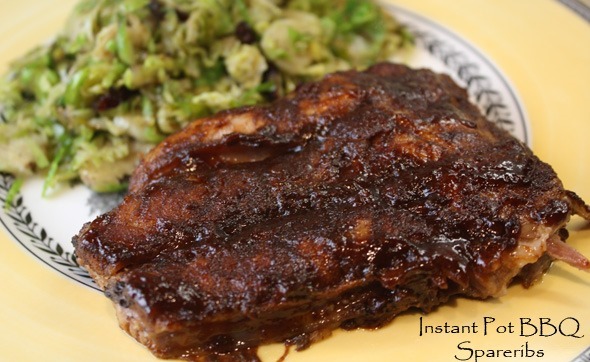 The pork is merely a vehicle for the sauce – I’m telling you – you’ll want to lick the plate it’s so good. The brine in this is composed of sugar, ancho chili powder, regular chili powder, smoked paprika, cayenne, cinnamon and buttermilk. Easy, providing you have all the ingredients. The thick-sliced bacon is wrapped around the pork once it’s brined for 24 hours and tied onto it. The fat from the bacon bastes the pork while it’s roasting in the oven. The pork is browned and then it’s roasted in the oven for about 20 minutes. It helps if you’ve made the cilantro pesto ahead of time – it’s not hard to make at all. It’s a typical pesto (oil, pine nuts, garlic), but instead of basil, it uses cilantro. The sauce is a combination of cream and butter, with some crumbled goat cheese (you can see it in the photo at top). The pesto is stirred into the sauce just before you’re ready to serve it – so it doesn’t actually cook – it’s just heated up. It’s SO full of flavor. The pork needs to rest for about 6-8 minutes after it comes out of the oven (to help pull back the good juices, so you don’t lose them as you slice), then you slice the tenderloins about 1/2 inch thick. The bacon, which has crisped up during the roasting, is chopped up and sprinkled on top once you’ve drizzled the sauce on top. Oh my. Fabulous. What’s GOOD: there is not anything about this recipe that ISN’T good. I’m telling you, you need to make this. Would make a fantastic company meal, for sure. Not hard to make – don’t be misled by all the ingredients below. It’s not all that hard to do. You’ll be emailing me afterwards, telling me how much you loved this. What’s NOT: only that it’s not all that healthy, unfortunately. I’d serve it with rice so you can sop up every tiny bit of the sauce. It’s that good. 1. BRINE: Whisk together buttermilk, sugar, salt, chile powders, oregano, paprika, cayenne and cinnamon. Pour into a 2-gallon (or two 1-gallon) zip type plastic bags. Remove fat and silverskin from the pork tenderloins and add to the marinade. Refrigerate for 4-24 hours. 2. Preheat oven to 400°. 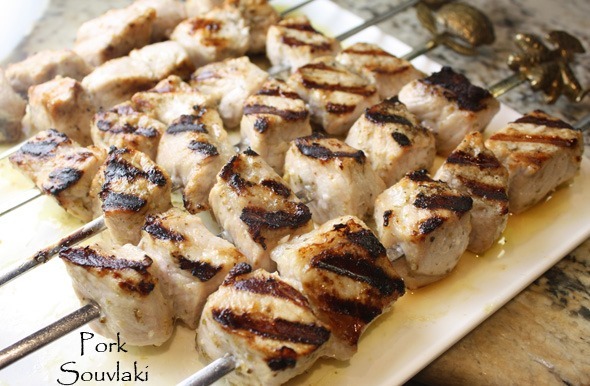 Remove pork from marinade and pat dry. Wrap bacon slices around the pork (lay out the twine before you do this – easier this way) and tie pork with kitchen twine every 1 1/2 inches (4-5 per tenderloin). Fold the tapered end under to make an even thickness. 3. Heat a large, nonstick skillet over medium heat and brown pork tenderloins and bacon 2 minutes per side. Transfer pork to a parchment-lined baking sheet (2 per sheet) and roast in oven for 15-20 minutes or until internal temperature reaches 150°F on an instant read thermometer. Remove pork from oven, tent with foil and allow to sit for 8 minutes or so. 4. 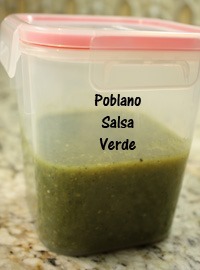 SAUCE: Prepare cilantro pesto by combining the garlic, chiles, cilantro, nuts, lime juice and oil in the food processor. Process to make a thick paste that is as smooth as possible – it will still be a bit chunky. 5. To finish sauce, heat cream and butter in a medium saucepan over medium heat until sauce comes to a boil; simmer until sauce thickens slightly, about 5 minutes. 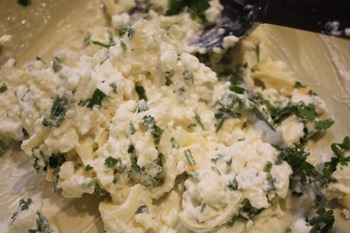 Whisk in the goat cheese and just before serving, whisk in the cilantro pesto. Allow to heat just briefly, but do not boil. Season to taste with salt and pepper. 6. Untie the pork tenderloins and remove the bacon (yes, really). Chop the bacon into small bits and slice the pork across each tenderloin diagonally (across the grain) in 1/2 inch thick slices. Serve several slices drizzled with the sauce and sprinkled with the chopped bacon. Per Serving: 413 Calories; 28g Fat (60.7% calories from fat); 27g Protein; 14g Carbohydrate; 2g Dietary Fiber; 131mg Cholesterol; 926mg Sodium.